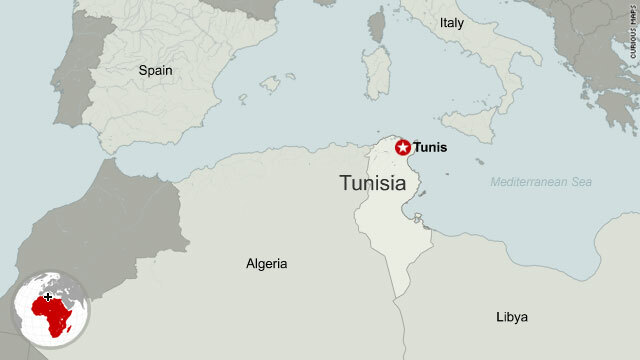 Tunis, Tunisia (CNN) -- Tunisia's army clashed with armed gangs in the capital and remnants of ousted President Zine El Abidine Ben Ali's personal guard Sunday as the country's prime minister said a unity government would be formed soon. Tanks patrolled the streets of Tunis on Sunday, two days after enraged protesters caused Ben Ali to flee the country. Government troops appeared to be in control of the presidential palace in the seaside suburb of Carthage on Sunday evening, but sporadic gunfire continued around the neighborhood as night fell, said Mohamad Guiga, a nearby resident. "It is a battle zone," Guiga told CNN by telephone from his home, about 1 kilometer (half a mile) from the palace. "From time to time, we hear some shooting," he said. The sound is very clear, he added. The head of Ben Ali's security force had been arrested earlier Sunday, according to state-run Tunis TV. Guiga said as many as 1,000 members of that force were holed up in a building near the palace when troops converged on the area around 5 p.m. (11 a.m. ET). "They asked us to go away, which we have done," said Guiga, a businessman who said he has no involvement in politics. The soldiers were backed by at least two helicopters and police and had the assistance of residents, who guided them through the neighborhood, he said. Abdel Latif Abid, a human rights lawyer and an opposition party founder, said the new government was expected to be announced Monday, with three opposition leaders holding ministry posts. The demonstrations were triggered by the suicide of an unemployed college graduate, who set himself ablaze in December after police confiscated the fruit cart that was his source of income. Prime Minister Mohamed Ghannouchi, who has been leading the government since Friday, said on Tunis TV Sunday night that a deal to form a new government -- with members of the opposition in the cabinet -- was near. Among those Abid said would be joining the government was Mustapha Ben Jafar, who is expected to serve as health minister. Earlier, Jafar said opposition leaders don't want to be a fig leaf for the ruling party, but want an active role in running Tunisia after more than two decades of authoritarian rule. "The most important thing for me is to build during this period the basis for a democratic Tunisia where all the citizens participate and where we can build a civic society -- this is what I spent 40 years of my life working for," Jafar said. Meanwhile, police made more arrests Sunday, including looters and some of the deposed president's relatives. Imed Trabelsi, the nephew of the ousted president, was detained along with 23 other relatives, Tunis TV reported. Troops also exchanged gunfire with armed gangs near the headquarters of an opposition party, Abid said. But Guiga said most Tunisians are happy with Ben Ali's ouster and have rallied to each other's aid since the uprising. "We are proud of those people -- simple people, young people, normal people -- who take care of each other," Guiga said. "One who doesn't have bread gives the other one bread, or water." Human rights groups and unions have said more than 50 people were killed in the protests before Ben Ali fled. At least 42 more died when a blaze swept through a prison in the eastern city of Monastir, but the cause of the blaze had not been determined. Fouad Mebazaa, a former parliament speaker, was named acting president Saturday. He promised to restore stability and respect the Constitution of the north African country, and state television reported that officials plan to hold presidential elections in 60 days. Meanwhile, restrictions on internet use -- including filters on social networking sites such as Facebook and YouTube -- that were put in place under Ben Ali have been dropped, and the new government has vowed to ease restrictions on freedoms. Meanwhile, Tunisians armed with sticks and knives have joined forces to guard their neighborhoods, stopping suspicious cars near their homes. Security forces did not have the manpower to guard the suburbs, they say. Amid the unrest, at least three Swedish nationals who were returning from a hunting trip were taken into police custody and some others were unaccounted for, Cecilia Julin, a spokeswoman for Sweden's Foreign Office, told CNN. The group of 13 Swedes had been hunting wild boar. Their taxis were stopped while they were returning to their hotel in Tunis, Julin said. "We don't know the exact whereabouts of all the Swedes or what exactly has happened to them, but we are trying to get all the details," she said. Video posted on Facebook shows a blond man with a bloodied face and nose being asked in English where he's from and replying, "Sweden." Julin said a local employee of the Swedish consulate identified the video as that of the men's arrest. A French photojournalist died Sunday morning in Tunis, according to his uncle, who said Lucas Mebrouk Dolega "was dedicated to his career and he was always very brave." "He was at the heart of major events happening around the world," Hamid Lhorri told CNN, though he did not elaborate on the circumstances surrounding his nephew's death. And in Washington, the U.S. State Department has warned Americans to put off nonessential travel to the country and authorized the departure of all family members of its employees. "U.S. citizens in Tunisia should closely examine their security situation in light of this and other recent developments and consider departing Tunisia," an updated travel warning advised. Some top officials in the region remained wary as protests swept over the nation. Libyan leader Moammar Gadhafi has said he was "sad and hurt" by the developments and blamed the unrest on criminal gangs. "Sadly, Tunisia is headed to more chaos, and we do not know how it will end," Gadhafi said in a televised speech Saturday night. "I hope your sanity returns and your wounds heal, because you had a big loss that will never return." Under Ben Ali, Tunisia had pro-Western policies and supported U.S. efforts against terrorism. President Barack Obama has condemned the use of force on protesters and called for free and fair elections, and Secretary of State Hillary Clinton offered U.S. support for Tunisians "as they and their government go through a period of significant transition," the State Department said Sunday. "She urged that the government work to re-establish order in the country in a responsible manner as quickly as possible," the State Department said. "She also underscored the importance of addressing popular concerns about the lack of civil liberties and economic opportunities, and the need to move forward with credible democratic elections." CNN's Ben Wedeman, Per Nyberg and Matt Smith contributed to this report.